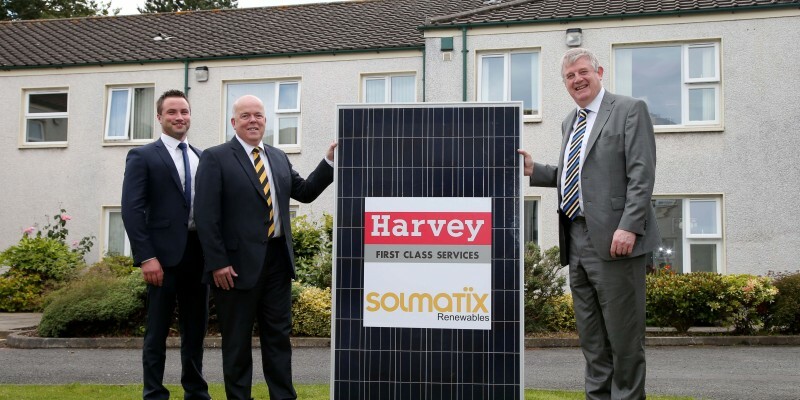 Newtownabbey-based M&E services company, Harvey Group, has acquired Northern Ireland renewable energy specialists, Solmatix Renewables in a move the companies say will transform the renewable energy sector in Northern Ireland and act as a springboard for further expansion into the multi-million pound UK and Ireland renewable energy markets. The acquisition, for an undisclosed sum, will bring to 110 the number of people employed directly by the Harvey Group in Northern Ireland and Great Britain. With a turnover of £30 million and over 80 staff, Harvey Group has over 30 years experience in the design, installation and maintenance of building services within every conceivable kind of building type throughout NI, GB and ROI, including Pharmaceutical/Cleanrooms, Laboratories, Education, Government and Healthcare . Richard and Norah-Anne Bell founded Solmatix Renewables in 2008, and since then the company has grown to achieve a turnover of £6 million, with 30 staff operating from its Nutts Corner premises. As a result of the deal, Solmatix will continue to operate as an autonomous and independent company within Harvey Group. Brian Harvey, managing director of Harvey Group, said there was a perfect fit between the two organisations. We have been planning to grow our renewables involvement for some time, either organically or through the acquisition of an established player. Having worked with Solmatix Renewables on a number of contracts, we had always been impressed with their engineering rigour and professionalism. In fact, there seemed to be a natural synergy between our two companies in terms of what we do and how we do it. I approached Richard Bell about a year ago to float the idea of our companies coming together, but only if there was a good fit. After careful consideration we both agreed that this would indeed be mutually beneficial. From my perspective, having Solmatix as part of Harvey Group gives us a level of expertise that would have taken us years to acquire otherwise. Richard Bell, the founder and managing director of Solmatix Renewables described the acquisition as great news for Solmatix, its customers, suppliers and staff. In many respects, it's a case of "╦£business as usual". However, in real terms, being part of this larger organisation will give us access to enhanced technical skills, financial resources and purchasing power. Ultimately I believe this will lead to greater growth and investment within our operations, as well as more jobs and job security. It's a win-win relationship that's good for our whole organisation, as well as the economy of Northern Ireland." Harvey Group began life as Harvey Heating Limited and was formed by Brian Harvey in 1978 with a focus on co-operation, innovation, quality, safety, attention to detail and value for money for his customers in both domestic and commercial HVAC premises. In 1985 Harvey Heating changed its name to Harvey Group Plc reflecting the ability to provide a one stop M&E Installation and Maintenance Facility. Independently British Standard certified Quality, Health & Safety and Environmental Management Systems have been in place since 1993 with Investors in People following in 2000 reflecting our commitment to our greatest asset our workforce. Harvey Group has been delivering M&E services for over 30 years. We enjoy a sound reputation for delivering our projects on time, on budget, safely, to a first-class finish and commissioned thoroughly. We have considerable experience in the complex servicing of Pharmaceutical / Production Cleanrooms, Laboratories, Government buildings and other complex, fast track, demanding building services projects throughout Northern Ireland. From a sustainability perspective, we have embraced and actively promote the minimisation of energy consumption and associated carbon emissions in the systems we design develop, install, commission and maintain ensuring that our clients can take balanced decisions on a life cycle, rather than the traditional pure capital cost basis.